One of the most common questions asked of the volunteer program is that what will I be doing? As a volunteer, your responsibilities will vary based on your expectations and on your level of involvement. As with any corporation, Wolf Timbers has a set of rules and regulations that all volunteers are expected to follow. The return that you receive for volunteering at Wolf Timbers is directly related to the amount of energy you put into volunteering. Most people, in considering volunteering, wish to have contact with the wolves. This is the main reason that most of our current volunteers donate their time. New volunteers are introduced to the wolves over a period of months. Depending on your particular circumstances, this introductory period may last longer or shorter. This introductory period is frustrating for some because they fail to realize and understand that wolves need to feel comfortable with the people around them. The only way for the wolves to feel comfortable around a new person is for that person to spend as much time as possible at Wolf Timbers and to follow all policies set forth. We have had a few human-wolf relationships ruined by individuals that fail to follow set policies or fail to follow directives from the experienced staff. These individuals do not last long at Wolf Timbers. It must also be stressed that not everyone that wishes to volunteer at Wolf Timbers will be able to interact directly with the wolves. We will make every attempt to allow those that volunteer at Wolf Timbers to interact with the wolves but we cannot guarantee this. Each individual brings with them a different set of circumstances. During your introductory period you will have limited contact with the wolves and be under strict supervision. You will also go through an orientation program to help you feel comfortable. Our orientation program is designed to allow you to receive the best possible experience volunteering. Your duties and amount of responsibility will gradually increase based on how your relationship with the wolves is progressing. Some of the duties that you can expect to share during the introductory phase are assisting the other volunteers in cleaning the enclosure, preparing food and assisting in educational programs. 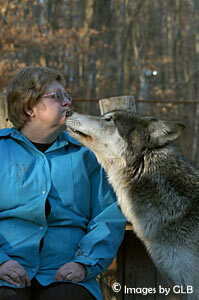 As you mature through our volunteer program, you will assist in feeding and observe how we handle the wolves. You will also participate in the continual socialization of the wolves. As you progress and demonstrate that you can share more responsibility, you will have the opportunity to leash walk the wolves, to provide or assist in medical care, participate in shaping the behavior of the wolves, to work on research projects and to be considered a staff volunteer. Volunteers also participate in: retrieving road-killed deer, fence construction and maintenance, security, being on call and office work, to name a few. We will work with you on your schedule and we also will not require you to do something that you just cannot do. 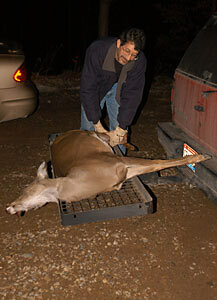 Many people find handling road-killed deer difficult; therefore, we will not require you to do so. We will then use you elsewhere. Wolf Timbers wants volunteers that are dedicated and committed to the overall health and vitality of the corporation. Please make sure that you have the time to volunteer. If you are interested in volunteering, complete our volunteer application and mail to Wolf Timbers. We will contact you to set up an interview. You can send us an e-mail request or snail mail a request for a volunteer application form to Wolf Timbers Volunteer Program, PO Box 107, Bolivar, OH 44612. You can also print and mail in the following application.